KRAFTY KORNER: What Color Is Your Plate? You are at:Home»English»KRAFTY KORNER: What Color Is Your Plate? Winter in SoCal passed through like a blink of the eye. A few showers and some chilly temps pretty much sum it up. Missed those alluring snow-capped mountains on my morning drive from the OC. Local crops and wildflowers are maturing earlier this year with the mild temps. Buy sustainable produce at your local farmer’s markets. To locate one in your neighborhood, go to www.cafarmersmarkets.com. There’s something very special about freshly picked strawberries, artichokes, asparagus, avocado, beets, lettuce. If you’re lucky to find the Sumo citrus, a tangerine-orange cross breed, grab it! Much bigger than a Satsuma, it’s seedless and tasty sweet. Be like a painter. Paint dabs of color on your plate. Those farmer’s markets fruits and veggies in vivid reds, greens and oranges will do the trick. Try to limit the whites, like sugar, flour and rice. For those beef, pork and lamb lovers, the most recent findings from a Harvard postdoctoral fellow study suggest two or three servings weekly of unprocessed red meats. Not processed, like bacon and lunch meats. Shucks! The next time you’re grocery shopping, dining out or picking up ready-made fast food, consider the four categories offered by the Academy of Nutrition and Dietetics: 1) fruits and veggies, 2) whole grains, 3) lean protein, and 4) low-fat dairy products. Balance and moderation are key. In other words, put less on that plate. Snack on fruits, veggies, nuts, yogurt. Too many empty calories, little health benefits come from sodas and fruit-flavored drinks. Read those labels. Better yet, switch to good ol’ water and 100 percent fruit juices. Try enhancing water with lemon, orange or cucumber slices for a different taste. Thumbs up for an occasional glass of red wine and divine dark chocolates. Nix milk or white chocolate, they don’t count. Seventy percent cacao should top the ingredients list. For the very best chocolate chip cookies, buy 70 per cent cacoa chocolate bars, then break into smaller pieces. Quality brands are Ghirardelli, Black and Green, Valhrona and Schaffen Berger. The closest find at local markets is a bag of Ghirardelli 60 percent cacao bittersweet chips. Amazon.com is an option. Healthy goes hand in hand with exercising. Zumba classes are riding a wave of popularity right now. Others prefer to run, I like walking. Armed with a newly acquired Omron pedometer, it keeps track of my daily steps. My goal is to attain 10,000 steps every day, then sustain it. Working on it! Welcome shoppers! The spring arts and crafts show are here. Walk to your heart’s content while checking out the latest in wearables with that Asian flair, plus the blingy-bling, handmade wares, paper goods, home décor, Easter and Mom’s Day gifts, munchies and much more. When Japan meets Los Angeles, the result is Japangeles. This iconic name is the brainchild of L.A.-bred T-shirt designer Roy Kuroyanagi. Take the kanji for Nihon, change it up with an overlaid L.A. American twist, and you get “I Love Nihon/LA” as a unique logo. 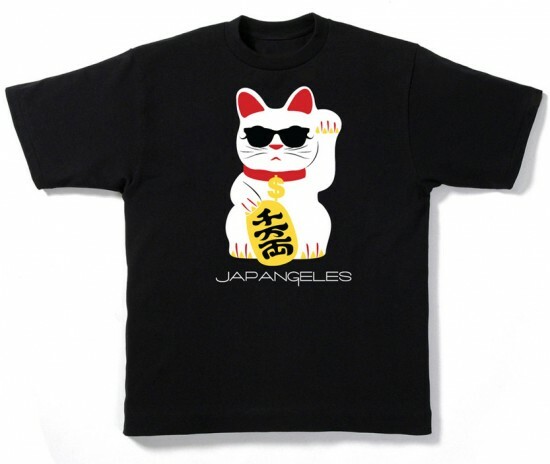 Japangeles has been rolling out pop art graphic T’s and accessories for four years. Sansei Kuroyanagi is focused on expansion over the coming years to San Francisco and Hawaii. A variety of unisex T’s will fit kids 10 years on up. Find them on Sunday at the Krafty Delites spring gift show, Carson Community Center. Touch of Nature’s spring event is this weekend in Diamond Bar. Add that splash of interior color with unique silk floral arrangements. Call the event coordinator for info. Sunday, March 25, 10 a.m. – 4 p.m.